Best Bible app! 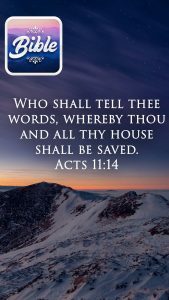 Download the Holy Bible now on your phone and bring the power of the Word to your daily life. You can read, listen and share the Scriptures for free! And take your Bible anywhere you go! – The complete King James Version with Charles Spurgeon’s commentaries. – Charles Spurgeon was the most extraordinary preacher of his day. He was called “The Prince of Preachers” because of his sermons. He was born in Kelvedon, Essex in 1834, to a family of clerics. He became a Baptist and began preaching in rural Cambridgeshire. Throughout his life, he evangelized around 10 million people and often preached 10 times a week in different places. Spurgeon’s sermons, commentaries, devotionals remain influential after his death in 1892. His sermons have been translated into several languages and are still one of the best-selling series of writings in history. – It is an audio Bible. Listen to the Bible and enjoy a new way of experiencing the Word of God! Find 10 minutes each day for deeper study and meditate on the teachings of the Scriptures. Get your personal Bible study now! It is simple to install and very easy to use!